I thought I was drowning, but all I really needed to do was breathe. Novaleigh Darrow’s life was falling apart––gone from structured and predictable, to something she couldn’t comprehend or recognize. So, when her mom suggested a trip home to Scotland, she relented. However, things there were just as complicated. One minute she was on the bridge near her grandparents’ house, contemplating how her past was now colliding with her present, and in the next, she was falling. Encased by water and chilled to the bone, Novaleigh woke to a land of Fae queens and talking otters where she was reminded: a dream of dying can become a chance to live––all you have to do is fall. A very pleasant audio surprise! Definitely. Although paranormal romance is not typically my chosen genre, this book was recommended to me for the narrator's performance and I could not be happier! The narration absolutely made the story come to life and the character choices were extremely entertaining; that coupled with Brynn Myers's sweet but poignant story of finding yourself in spite of yourself makes this a recommendation I will surely give in the future. Strong female characters that also have a genuine vulnerability to them is a difficult tightrope to walk and Myers does so beautifully. The narrator does such an amazing job of personifying the proud and self-assured but undoubtedly broken Novi, you can't help but identify with her. There is a subtlety to the writing and the portrayal that makes the story itself is so relatable. Novi chooses to leave behind everything she knows to pursue a dream that falls apart, explained through "flashbacks" in the book. It takes time for her to come to terms with letting go of her shame and the guilt caused by her choices so she can truly find herself, in an extremely unlikely place. Which character – as performed by Andrea Parsneau – was your favorite? Character-wise I greatly enjoyed Lithia. The dripping venom in her words made her a solid villain without being too over the top. The characters in this book in general are just a treat to listen to across the board. Yes. It's a short enough length that it was easy to listen to in a day without feeling like the story was rushed. The writing and story are beautifully done but this title really shines with the stellar work by Andrea Parsneau. I cannot find more work by her right now as it seems she is a newer narrator, but I hope to see more from her soon (and maybe in other genres as well, I can only listen to so many romance novels ;)). Overall a VERY enjoyable listen. Wow, I wasn't expecting that. Alice in wonderland meets Peggy Sue got married. The narrator does a bang up job. She might turn into a favorite for me. This audiobook was given to me for free at my request from the publisher or author or narrator and I provided this voluntary review. Easy-to-read, Entertaining, Great world building, Happily Ever After, Original, Page-turner, Romantic, Twisted, Unpredictable Witty, Wonderful characters. Excellent Read! Don't let 'Romance' deter you! First of all, I do not believe this book should be categorized in the Romance genre - although there are pieces of a love story as part of the story arc, this is definitely more of a Fantasy tale. Some Fantasy readers might be put-off or not even find this amazing book due to the way it is categorized which is truly sad. Not knowing what to expect, I started listening to this book with an open mind. I was in for a treat! Andrea Parsneau's narration immediately brought this story to life between her own soothing voice to talking otters to her Scottish family to ethereal faeries. She made this book sound like it was voiced by a cast rather than only herself - that is how well she did! For the story itself, it is a fine journey of self-reflection or rather self-focus after one falls out of focus. It touched my heart as it brought out my own emotions as I laughed and cried along with the main character as she comes back into focus. Loving story of one battling their inner demons in a fun fantasy way. Where does Falling Out of Focus rank among all the audiobooks you’ve listened to so far? Falling Out of Focus ranks as one of my favorite audios! If you’ve ever ridden a classic, much beloved ride such as Forbidden Journey at Universal or It’s a Small World at Disney World, you may be able to relate to discovering something new in the experience every time you ride. Falling Out of Focus is like that. I hope to hit play with it again soon! Without a doubt, Novaleigh was my favorite character as the story is her journey of self-discovery and self-healing. Novaleigh Darrow has fallen out of focus. She is burdened by guilt for the choices she’s made and the expectations she feels that she’s not lived up to. Her life has come to a crossroads and she needs to make choices between light and dark paths. Nothing is written in stone. The choice is always hers. But, the colorful characters in this tale ensure that Novaleigh sees the whole picture, not just the light’s view or the view of the dark. The supporting cast include, but are certainly not limited to, Oliver, a talking otter and Novaleigh’s guide on her journey to find her way back to who she is and who she wants to be; twin queens who rather bizarrely talk in alternating sing-song; and creepy harlequin clowns. It's impossible for me to pick one favorite character as performed by Andrea Parsneau. She performed all the characters extremely well. This is the first time I've ever listened to Andrea Parsneau and hope that it won't be the last. Her voice is clear and easy to understand and she consistently differentiates between the characters to where I had no issue whatsoever knowing who was speaking at any time. Her voice is so spot on that it literally gave me chills when the tone was dark; evoked tears when our heroine was either overwhelmed or sad; and elicited feelings of delight when her surroundings were happy or joyful. The audio production is polished perfection. I did not want to put the audio down and snuck in additional audio time every chance I could. Without a doubt, Andrea Parsneau’s performance added to my pleasure of listening to Falling Out of Focus. 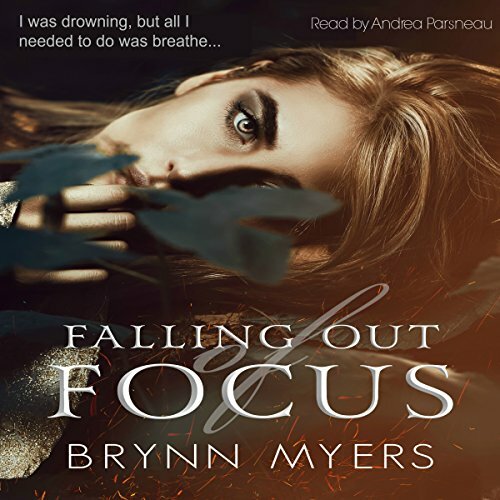 Falling Out of Focus by the fantastically talented Brynn Myers is a wondrous journey of self-discovery and self-healing commingled with Arthurian, Alice in Wonderland and Labyrinth dark fantasy feels. I confess that, at first, I thought I was reading a very imaginative fractured fairy tale. My original impression changed dramatically as I continued reading and the story morphed into so much more. Falling Out of Focus is inventive, magical, scary, heartfelt and thought-provoking. There’s also a touch of romance. Falling Out of Focus is an incredible adventure. I wasn't sure what to expect when I started listening to Falling Out of Focus but was very pleasantly surprised. Novi's journey of self discovery and acceptance in a fantasy world is one that will make listeners re-examine what is truly important in their lives. The story had a very fresh approach with terrific narration. This was a thought provoking and enjoyable listen that I would highly recommend. I was voluntarily provided this review copy audiobook at no charge by the author, publisher and/or narrator. This review is my honest opinion. As I listened this wonderful story, I was awed at how the reader was put into the middle of the heroine’s problems and doubts from the beginning and the ending was a perfect. Brynn Myers spun a tale filled with fantasy that is rooted in every humans reality of life! Thank you for the book that will stay with me for a long time. Andrea Parsneau outdid herself again bravo. I highly recommend this book to anyone who wants to have their hearts touched by the telling of this story. This book will make you look at yourself in a different way. the author took the story to a much higher level than expected. As Novi meet and interacted with each character you could feel the struggle for self. This book will make you think, look into your inner most thoughts and bring them to the light. What you do with them after that is your choice. Sometimes you need a kick in the pants to bring about true healing. this book will help. I got this book via audiobook boom. This is by no means a book to help you discover yourself. But it will make you take a closer look at your own inner demons that you keep hidden from the world. Opens your eyes to how you yourself deal with thing! Good Alice in wonderland style approach to self understanding and enlightenment. Really made me think on and apply some of the lessons learned to me and how I deal with things.Great narration with the exception of the "dulled out" voices for some parts to illustrate an altered state. Would you consider the audio edition of Falling Out of Focus to be better than the print version? I wouldn't know...I have read the print version, however, the voices to do bring the characters to life, but in print form your imagination would bring the characters to life. that she had to find her own path home. Gavin...I liked the Scottish accent she gave him. .Reality revised .A tale of utter beauty . What made the experience of listening to Falling Out of Focus the most enjoyable? WAW.Epicness. That's the only word I can think of to describe Falling out of Focus in order to encompass its complexity and pure awesomeness, It utterly blew my mind away and broke my heart into teensy tiny pieces and rebuilt it as the book went on as we journeyed with Novaleigh worlds collided,we all went down the rabbit hole and the earth shook as her story unfolded.Its truly a beautiful masterpiece that will make even the stoniest hearts come to life.I can honestly say that ,excluding my rabbit hole comment,I have never read anything like it.I was looking forward to listening but this jewel surpassed expectation. Andrea Parsneau breathes life in to the story with her beautiful emotion evoking narration and brings Brynn Myers' words to life in an audiobook That is now and I think in years to come will be one of my favorites that I will hold close to my heart and soul.This book will take you on a journey of self reflection,I honestly cant see how it couldnt for anybody.So Get ready to be inspired and re-evaluate what you think you know about yourself and your outlook on life and everything in it.